Forgetfulone: You Make Me Smile, Too! Tamy at 3 Sides of Crazy gave out this award that her friend created (Tismee 2 of Squared Off). Isn't it cute? And she makes me smile, too! Here's to my best bloggy friends! I almost forgot she also gave me this one! And it's for all of you, too, because you are really super commenters. Thanks for every comment you leave me. Have a great day and a great week, ladies! Thank you! You know you make me smile, too! Thanks Diana! Have a great week! & right back at you Diane! 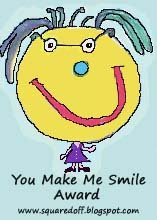 You make me smile too!! 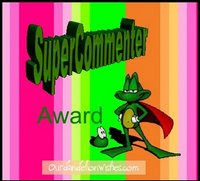 YOU are a super commenter too! congrats on the well deserved awards buddy.